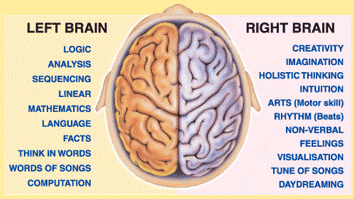 In general, the left and right hemispheres of our brain process information in different ways. While we have a natural tendency towards one way of thinking, the two sides of our brain work together in our everyday lives. The right brain of the brain focuses on the visual, and processes information in an intuitive and simultaneous way, looking first at the whole picture then the details. The focus of the left brain is verbal, processing information in an analytical and sequential way, looking first at the pieces then putting them together to get the whole. Left brain thinking is verbal and analytical. Right brain is non-verbal and intuitive, using pictures rather than words. This seems to be a mirror image of what we see when we look at left and right when this is applied to political leaning. Exemplified by muddled thinking, emotion driven, a dislike of hard evidence, harsh shrieking voices, a lack of argument made up by vitriol and an absolute hatred of an opposing point of view. The position of “I am so correct in my view, that I can be as abusive and obnoxious as I want, as you are wrong, and therefore evil”, with the subsequent shutdown of debate. Public funding comes from a magic money tree, or some other mechanism, because we are all tax payers right? So lets squeeze these non tax payers more, cos they don’t pay no tax. People in boats, who have paid thousands to make a very dangerous trip to escape a war zone need our help. People in boats, who have paid thousands to make a very dangerous trip to better their lives need our help. Lets just let anyone who wants to enter the UK come on in. People in the Arts are better informed to tell us what to think. If someone wants to live on benefits, and not work, who are you to judge their lifestyle choice, as this is their free choice. When I see something I disagree with, I don’t want to see it anymore, and will campaign for my right not to be offended. A lack of humour, distinguished by their singular seriousness. Exemplified by a factual, considered approach, accommodating to the opposite view, but with reasoned argument, often accompanied by humour, and with an eye on historical context. People in boats, who have paid thousands to make a very dangerous trip are being exploited by the people who provide the boats, this is a criminal enterprise and should be stopped. People who need help should be taken from camps, otherwise anarchy ensues. If demand for public services and housing outstrips supply, then there is a problem. Emotions are based on reactions to facts or situations. Living on benefits is not a lifestyle choice, it’s a cop-out. When I see something I disagree with, I will argue against it, I wont argue for it to be extinguished. Encourage freedom of speech, and ridicule if deserved. It appears that the political right are “left”, but almost certainly, the political left are not right.